As the fall commences, KBI staff are scheduled for a busy season of speaking engagements and panel discussions, including a presentation to mark the canonization of Archbishop Óscar Romero. Information is also available about two KBI fundraisers—an art auction in Phoenix later this week and the annual Tucson Fiesta in October. And we share a listing for a job opening—the KBI/Florence Project Legal Fellow—as well as details about August immersion experiences. The KBI on the Road: Father Sean Carroll, S.J., the KBI’s Executive Director, will travel extensively during October, offering presentations and participating in a range of panel discussions. Destinations and events include: Southern California to address administrators of Jesuit high schools in the Western U.S.; the Diocese of Tucson’s Religious Convocation on Immigration; Regis University in Denver, CO for a conference entitled “The Joy of the Gospel: On the Vision of Francis after Five Years as Pope”; Our Lady of Guadalupe Parish in San Diego, CA to discuss Ignatian Spirituality and Social Justice; and a Summit for Social Research at the University of San Francisco. He will also be part of a panel presentation about the book Rules for a Flat World: Why Humans Invented Law and How to Reinvent It for a Complex Global Economy by Professor Gillian Hadfield. KBI Director of Education and Advocacy Joanna Williams will speak at Xavier University in Cincinnati, OH in late September; for more information about the Campaign for Solidarity, please check out this web site : https://ignatiansolidarity.net/campaignforhospitality/2018/05/17/encounter-hospitality-bellarmine-chapel/. 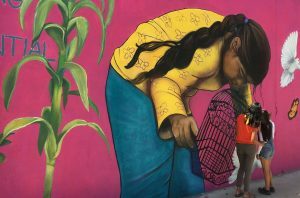 A mural by Lucinda Yrene, one of the artists featured in “Migrant Stories – Art Benefit for the KBI” in Phoenix. Other contributing artists are: Diana Calderón, Reggie Casillas, Edgar Fernandez, Rigo Flores, Sam Fresquez, Sam Gomez, Xylena Lopez, and Andria Brunell. Art Auction for the KBI: A group visit to the KBI shelter by nine Arizona artists inspired the creation of moving artworks addressing the migrant experience. These pieces will be auctioned off at “Migrant Stories – Art Benefit” with half the proceeds donated to the KBI. A private viewing and live auction will be held on Thursday, September 20, 2018, 4:30–6:30pm at the Sagrado Galleria, 6437 S. Central Avenue, Phoenix, AZ. Limited reservations are still available, free of charge, and you can secure your place by emailing KBI board member and one of the event organizers, Yolie Aleman-Rodriguez, at yoliealemanrodriguez@gmail.com. A second viewing is scheduled for the same evening at 7:00–9:30pm to share the art with the wider community (space constraints limit viewings to 50 people) and sell any unauctioned artwork. Tucson Fundraiser: The fourth annual Tucson Fiesta is set for Sunday, October 21, 2018 at the home of KBI board vice-chair Luis Dabdoub and his wife Susana Dabdoub. This fundraiser benefits KBI direct aid, education, and advocacy programs, and Executive Director Father Sean Carroll, S.J. will be in attendance to speak about the KBI’s work and mission. Kino Teens from Salpointe Catholic High School will also share their stories of volunteering with the KBI at the border. Don’t miss this opportunity to celebrate and support the KBI’s ongoing work. For more details and to make a reservation, go to: https://www.kinoborderinitiative.org/2018-tucson-fiesta/. Thank you! 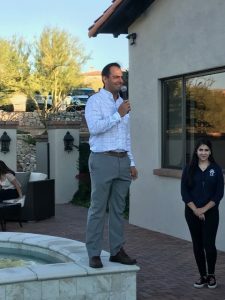 KBI board vice-chair and Tucson Fiesta host Luis Dabdoub greeted guests at the last year’s fundraiser, an event that raised close to $10,000 for the KBI. KBI/Florence Project Legal Fellow: The KBI is seeking a new legal fellow to work with asylum seekers received at the comedor and shelter. Moving into its second year, this program was conceived with the goal of formulating comprehensive and strategically strong asylum cases and, in so doing, help advance immigration law. For details about applying for the legal fellow position, please see—and share—the new job listing at: https://firrp-hfvr7nehlhvix.netdna-ssl.com/wp-content/uploads/2018/08/KBI-Legal-Fellow_Job-Posting_8-01-18.pdf.